This page provides a very simple walk-through to get you up and running. If there is only one document you will take the time to read, it is this one. For additional help, see the user manual, or search this wiki. If your battery is in its case, and you find it difficult to open the battery case, try one of these methods. Stick a fingernail into each corner of one end and then run it around one side to past the 3/4 mark. Squeeze the bottom half just a smidge where the semi-circular markings are on the sides and the top pops off fairly easily. Hold the case vertically, get a fingernail between the gaps and slowly separate the two sides. 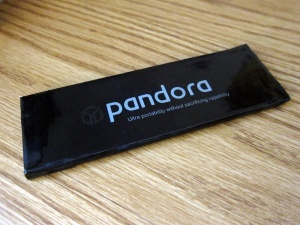 The battery cover is on the bottom of the Pandora, held on by two tabs. Remove the battery cover by pulling on those two tabs. One side of the battery has three copper contacts. Line up the three contacts up with three copper contacts on the Pandora and insert the battery. Add the battery cover and make sure it's closed completely. If your Pandora has issues staying powered on, and you're sure it's charged properly, then perhaps the battery is not seated correctly. Ensure the cover is on tightly. If the battery is still loose, try inserting a folded piece of paper in top of the battery before closing the battery cover. 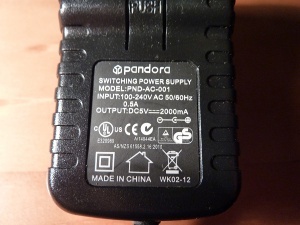 When inserting the battery, the Pandora will begin booting up automatically. It's ok to keep your Pandora plugged in overnight to charge. It's ok to charge your Pandora at any time. You do not need to worry about "over charging" it. It's ok to use your Pandora until it runs out of power and shuts down. It's ok to leave your Pandora laying around not plugged in. 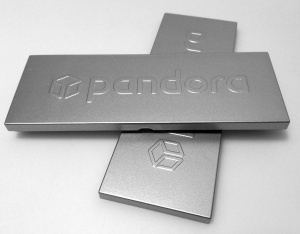 All batteries will diminish in strength over time, and the Pandora's battery is no different. It will discharge about 5% each week. This does not damage it. It can be charged up again as normal. Plug the charger into the mains. Depending on your region, you may need to use the provided mains adapter. Plug the charger into the Pandora. A green light at the right hand will shine as the Pandora wakes up. Soon after, a red light will appear next to this. If your battery is completely drained, you may need to wait between 10 and 30 minutes for it to trickle-charge enough to wake up. 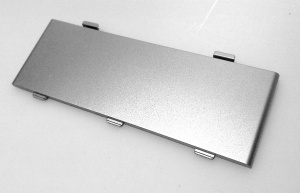 The stylus fits in a slot in the bottom, near the front and on the right hand side. It slides in parallel to the battery. Pull on it to slide it out. A new Pandora's stylus may be a little bit "firm". Over time it will become easier to pull out and push back in. For a brand new stylus, 'write' on some regular paper. This will polish the tip and help prevent scratches on your screen when using it. You can also apply a screen protector to achieve this. Writing on paper may leave black streaks, as you rub some plastic onto the paper. Get used to putting your stylus away inside the Pandora. Don't leave it elsewhere. Don't lose it! Some information is needed at this stage to set things up. Make sure you keep the charger plugged in. All of these settings can be updated later. After booting, a dialogue will offer to shutdown, or start the configuration. Press 'Start Now' with the stylus. This is your username. It must not contain spaces. (and confirmation). Do not forget your password! How your machine appears on a network. Again no spaces. Short is good. Select if you want to login automatically with no password prompt. This tutorial uses XFCE, a complete Linux desktop environment. Select the timezone you are in. Your Pandora will reboot once this step is complete. You can now unplug from mains if need be. This step is optional, you can use another PC to download apps to an SD card or USB stick. Note: You must already have actual wireless networking set up and working in your household. 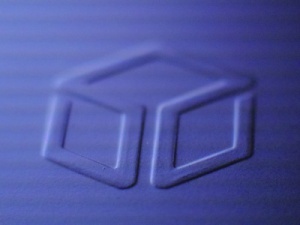 The pandora only receives signals from a base-station. You may be able to find a free wireless internet connection where you are. Most libraries and some coffee shops provide one. A popup might say networks are available. 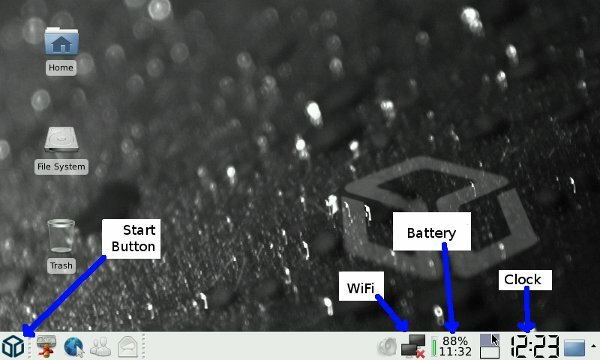 To the left of the battery indicator (a %charge and small run-time) is the network manager icon - A black square. Move the mouse with the left nub, and left click by moving the right nub to the left. Select your wireless connection. If you have security enabled, you will be prompted for details. You can also right click (nub to the right) to turn networking on and off. A spinning circle indicates the connection is in progress. The chosen GUI will appear the next time you log in. There is a choice between Xfce, Minimenu and OpenBox. To shutdown, remove the charger. Otherwise the pandora will reboot. Press the [Pandora] button for the menu. If those do not work, you can hard shut-down. This page was last edited on 10 June 2014, at 02:08.